Russian manned spaceplane. Competitor with Buran. Unique Russian space shuttle design of 1974. Hydrofoil-launched, winged recoverable first and second stages. Status: Study 1974. Payload: 30,000 kg (66,000 lb). Thrust: 7,263.40 kN (1,632,877 lbf). Gross mass: 320,000 kg (700,000 lb). Height: 109.00 m (357.00 ft). Diameter: 7.00 m (22.90 ft). Span: 25.00 m (82.00 ft). Apogee: 220 km (130 mi). 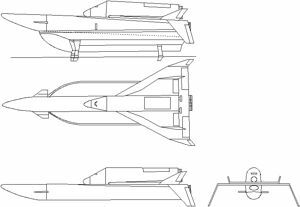 Hydrofoil would have been propelled to launch speed by the launch vehicles rocket engines, using a 200 metric ton fuel store in the hydrofoil. 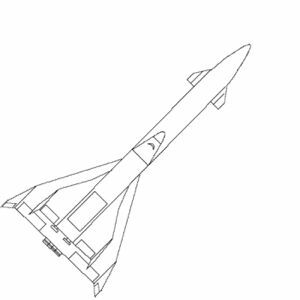 Advantages: launch from the Caspian Sea into a variety of orbital inclinations, variations in launch track possible to meet range safety requirements. Proposal of Alexeyev/Sukhoi OKBs. Crew Size: 2. LEO Payload: 30,000 kg (66,000 lb) to a 220 km orbit. Stage 0. 1 x Albatros Momentum Block. Gross Mass: 2,000,000 kg (4,400,000 lb). Empty Mass: 1,800,000 kg (3,900,000 lb). Isp: 455 sec. Burn time: 110 sec. Isp(sl): 337 sec. Diameter: 10.00 m (32.00 ft). Span: 20.00 m (65.00 ft). Length: 70.00 m (229.00 ft). Propellants: Lox/LH2. Engine: None. Status: Study 1974. Comments: Unique hydrofoil launch stage for Albatros. Contains 200,000 kg propellants for acceleration by Albatros stage 1 motors to 50 m/s / 180 km/hr launch conditions. Designed by Alexeyev Hydrofoil/Ekranoplan OKB. Stage 1. 1 x Albatros Carrier Aircraft. Gross Mass: 1,250,000 kg (2,750,000 lb). Empty Mass: 210,000 kg (460,000 lb). Thrust (vac): 7,840.000 kN (1,762,500 lbf). Isp: 455 sec. Burn time: 580 sec. Isp(sl): 337 sec. Diameter: 7.00 m (22.90 ft). Span: 40.00 m (131.00 ft). Length: 91.00 m (298.00 ft). Propellants: Lox/LH2. No Engines: 4. Engine: RD-0120. Status: Study 1974. Comments: Configuration: delta wing with wingtip vertical stabilizers and canards. Engine type and performance, empty weight estimated. Stage 2. 1 x Albatros Raketoplan. Gross Mass: 320,000 kg (700,000 lb). Empty Mass: 82,000 kg (180,000 lb). Thrust (vac): 1,960.000 kN (440,620 lbf). Isp: 455 sec. Burn time: 270 sec. Isp(sl): 337 sec. Diameter: 7.00 m (22.90 ft). Span: 25.00 m (82.00 ft). Length: 49.00 m (160.00 ft). Propellants: Lox/LH2. No Engines: 4. Status: Study 1974. Comments: Configuration: delta wing with wingtip vertical stabilizers. Family: orbital launch vehicle, ship-launched, Sled-Launched, Spaceplane, Winged. Country: Russia. Engines: None, RD-0120. Spacecraft: Albatros. Stages: Albatros Raketoplan, Albatros Carrier Aircraft, Albatros Momentum Block. Agency: Alekseyev bureau, Sukhoi. Bibliography: 130.